Benny was traumatized after suffering torture at an illegal slaughter farm. But he’s safe now at Rooterville, where he loves treats and nibbling the grass! 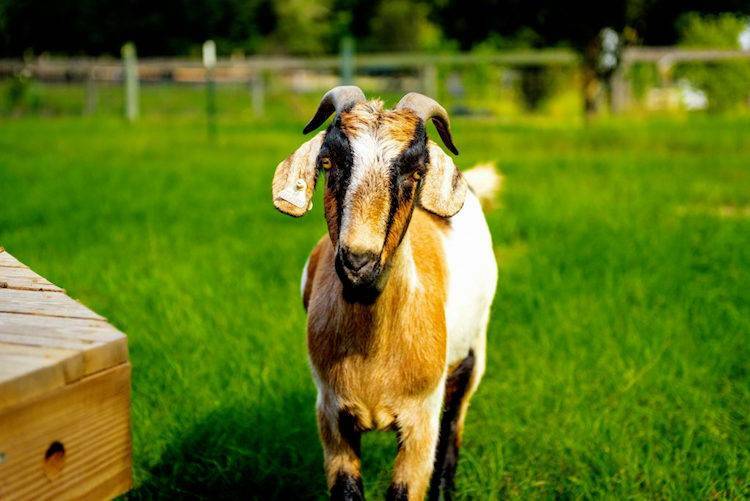 Benny and two of his goat friends were rescued by investigators from an illegal slaughter farm in Miami, where the animals were subject to unspeakable tortures and deadly neglect. They were so dehydrated that even though these investigators took them straight to Rooterville, only Benny survived. One of Benny’s friends died on the way, and another died despite three days of dedicated, intensive care from the Rooterville vet. Because of the terrible treatment he received at the slaughter farm, Benny is scared of most people. Even after four years, the trauma of those horrible experiences never leave an animal anymore than they’d leave a person. Despite his fear of people, Benny loves to play with his new friends at Rooterville, loves treats, and never gets tired of all of the delicious grass!